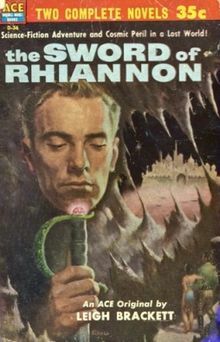 First published in 1949 as “The Sea-Kings Of Mars”, The Sword Of Rhiannon is among the best science fantasy stories to emerge from the later golden age of science fiction. Leigh Brackett was one of the few women writing in the science fiction and fantasy fields during this time. She would later go on to marry another SF writer, Edmond Hamilton, and write extensively for Hollywood. One of her last works was treatment for the second Star Wars movie. The Sword of Rhiannon is a planetary adventure novel which takes place on Mars. This is not the Mars we know today with little air, but the one of 1940’s, where it was still assumed to have canals and a breathable atmosphere. This is the same Mars which would figure so eloquently into Ray Bradbury and Edgar Rice Burroughs stories. Here, Mars is a place of exotic landscapes which offers the terrestrial traveler the chance for adventure and redemption. Released in 1953 as an Ace Double, it was paired with a Robert E. Howard Conan novel. “Carse left the canal, turning his back on the dead sea-bottom and facing what had once been inland. The ground rose sharply to the upper cliffs, much gnawed and worn by time and the eternal wind. The old city brooded there, the ancient stronghold of the Sea Kings of Jekkara, its glory long stripped from it by the dropping of the sea. The book begins with Matthew Carse arrival on Mars and appears to be set in the near future. Carse has come to Mars as an archeologist and is studying the lost civilizations of the planet. Most of the scenery is arid, the vast oceans of Mars have dried-up millenia ago. One night a tomb robber lures him outside the city boundaries where he is living to examine an undiscovered find. The tomb, the robber explains, is that of Rhiannon, the ancient and accursed bringer of knowledge to the humanoid races of Mars. Carse finds the tomb, but falls into an inter-dimensional void holding the sword from the tomb. When he emerges from the void, he still finds himself inside the tomb, but the Mars outside in the one which existed a million years ago. Trapped in the past, he makes his way back to the city, which is now a port town on a vast ocean. He’s rescued from a mob who thinks he’s a foreign spy. But his saviour, a fat thief named Boghaz, has recognized the sword Carse is carrying as being the one belonging to Rhiannon. He tries to steal it for himself, but both men are captured by the city guard and press-ganged into service as galley slaves on a royal ship. The vessel is carrying the haughty Princess Ywain of Sark on a diplomatic mission to one of her father’s allies in their continual war against the Sea-King freebooters. Brackett’s style is romantic and atmospheric. She writes of women walking along the canals with bells tinkling in the evening. Of the Martian moons rising over the seas. Her characters have names such as “Ironbeard”. Mars is a place for mythic transformation in her mind. It’s the Mars of Lawrence of Arabia and The Man Who Would Be King. Since she was writing in the 1940’s, you can feel a the lure of exotic lands in her descriptions. Her characters are multi-faceted too. The archaeologist who ends up leading a war ship. The thief who becomes a great leader. And the princess humbled by a man from distant lands. I’m surprised this short novel doesn’t have a better following. The Sword Of Rhiannon is an epic science fantasy tale. 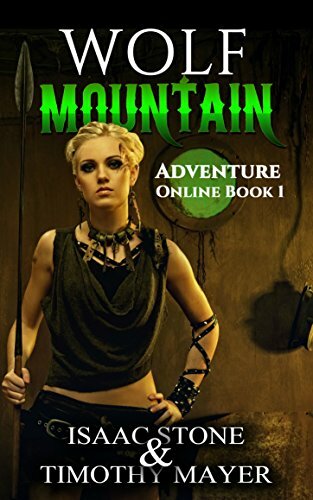 It ranks with the best works of Robert E Howard and Charles Saunders.